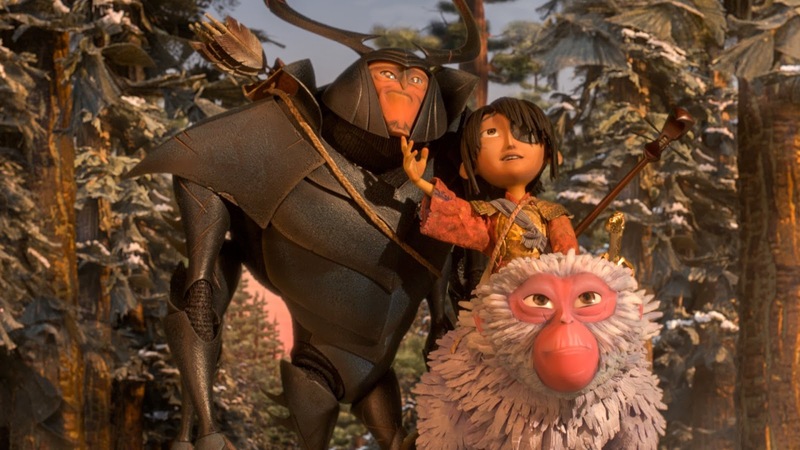 If you want dark animation one need look no further than the out put of Laika a firm that specializes in stop motion animation. The company was formed when Phil Knight of Nike invested in the Vil Vinton Studios and then removed Vinton and started up feature production. Its a messy tale that is best told else where. Laika's first film was CORALINE based upon the novel by Neil Gaiman and directed by Henry Selig who did NIGHTMARE BEFORE CHRISTMAS. Selick did the MOON GIRL short before heading off. The company then released PARANORMAN, BOX TROLLS and most recently KUBO AND THE TWO STRINGS. While the films have made money, none have been major hits with the ultimate fate of KUBO still up in the air. While I like and can appreciate what Laika is doing I'm kind of left to ponder where they are headed. Blessed with a a unique look and animating in a style that almost no one uses any more Laika is a one of a kind production house, If you add to it the fact that all of the features have a real darkness to them you really wonder how the company can continuously do what it does, when I know several kids are frightened by the films and outside or CORALINE I don't know of any one who rewatches any of their other films. This isn't to knock the studio, but there is a real danger producing films that cost tens of millions of dollars and are nominally geared toward children who are so over protected that the images scare the bejeezus out of them. And such it is with their most recent film KUBO AND THE TWO STRINGS. Being sold as an adventure film, it is really a dark fantasy where a young boy has to flee his grandfather who wants to blind him. He has to hide out with his mother who has broken mentally and fears that her blind sisters will come and disfigure her son further. Its a film filled with death and pain. While I like the film a great deal, I still have trouble with its cavalier attitude toward pain and suffering. The film seems to think nothing of the inherent violence in the tale Kubo loses his mother twice and his father once immediately after discovering who he is. Its a traumatic thing and the film just sort of takes it in stride and goes on. The problem with the film, like the problem with the other films Laika has produced other than CORALINE is that the company really doesn't know how to handle the darkness. There is a ghoulishness to PARANORMAN that has kept me from revisiting it and there is a real nasty edge to BOX TROLLS that I also find trouble some. While I don't mind the nasty edge, and welcome it as a nod to the real Brother Grimm, I don't think the company has the finesse to really make it work. While watching KUBO I was constantly struck by the notion that the filmmakers were trying to ape a Neil Gaiman fairy tale. Say what you will Kubo moves like someone following a Gaiman template. If we do these things and have those things happen then we'll have a Neil story. The problem is that while the story has the structure that mimics a Gaiman story it is missing the heart>?Where is the danger? There never is any, not really. In CORALINE there is a sense that anything can happen. We know that Coraline will be okay, but at the same time we can't be certain in what form that will be. In the film there is sense of danger and we feel for any price that she will have to pay to get it. On the other hand in KUBO there is no real danger to KUBO. All the pain and suffering is directed at Monkey and Beetle, And while Kubo loses his parents, it not a real loss because he just seems to shake it off and go on- hell we have the final fade out of the KUBO and the ghost parents. Having this darkness without cost doesn't work. Without the cost to pain ratio you either have it not mean anything or just be really creepy in the wrong sort of way. How are we supposed to really feel for Kubo's journey when he really doesn't overcome anything- it's all his parents work - think about it, its true-they do most of the work. The trouble for me with this not really being a quest for Kubo is that without him suffering, without him overcoming obstacles on his own the final confrontation with his grandfather is a nonstarter. How can we root for him when he has done very little? I understand some people have wet themselves with joy over KUBO but at the same time I think its a film that you have to bring an inordinate amount of preconceived notions with you for it to work. In all honesty I think that if someone like Neil Gaiman, or JM DeMatties or Jeph Loeb had written it would have had the right resonances and not felt like it was by the numbers. And that is the problem with Laika. They don't know how to structure the dark tales they are telling. Yes, they make you feel the unease and the pain but at the same time they don't know how to connect it up to the human psyche and soul and until they do that their films will turn a profit but they will never be a mega hit or be considered a classic.